The ADTMWSA1 mobile laptop workstation has all the features any office professional will love. From a height adjustable design to smooth rolling wheels, the flexibility is sure to deliver. Learn about the advantages of adding a sit-stand desk to your office in the above video. SAMANTHA (Narrator): "If your workflow demands a workstation that is both versatile and portable, then these AIDATA sit-stand desks are perfect for you. Rest your laptop on the plastic top surface and enjoy the convenience of mobility while you work. Lock the rolling casters for stability or keep them unlocked for rollability. 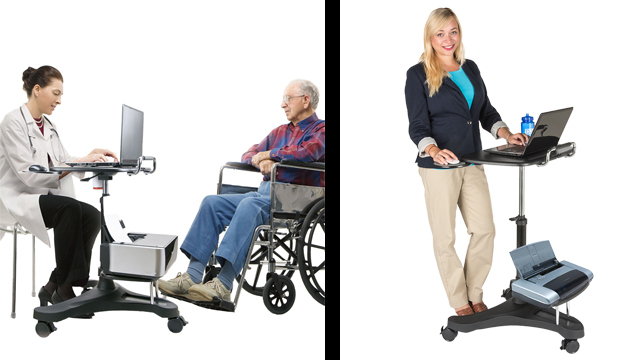 A pneumatic pole allows you to raise and lower the workstation to suit your needs, whether you're sitting or standing. A retractable mousetray and cup holder add more convenience while a compact printer shelf sits just above the wishbone-shaped base. This mobile laptop workstation with plastic printer shelf is a great supplement for the modern workflow."